Made this bento before I headed to the F-F-FREEEEZING farmers market today. My poor little fingers were in pain from the scooter ride there, even with gloves on. This bento is a little light on veggies, so I really needed to make that trip to the Santa Rosa Original Certified Farmers Market. 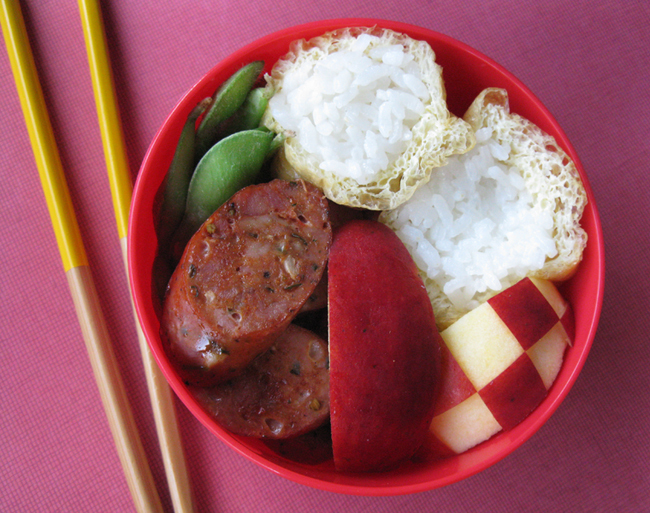 In this bento: steamed edamame, inarizushi (fried tofu pouches filled with rice), Arkansas Black apples from Walker's Apples, and italian chicken sausages from Aidells. This was the first time I tried doing a checkerboard cut on an apple, and it worked pretty well. :) I only spent about 2 minutes on the pattern. 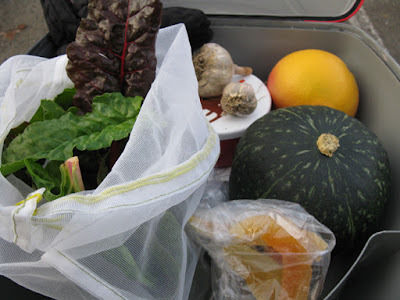 Here's my haul from the farmers market today: baby chard and a kabocha squash from Triple T Ranch, garlic from Armstrong Valley Farm, a ruby red grapefruit from De'Santis Farms, and some dried sweet melon slices from Neufeld Farms. There are lots of great things at the market during the winter season. Don't miss out! The Santa Rosa Original Certified Farmers Market is open every Wednesday and Saturday from 8:30am to noon right next to the vets building. Inarizushi I wanted to try out soon again. I've yet they dared to make. Let's see if they succeed. You took a scooter ride TODAY? My god, woman, it's a miracle you're alive! I went this morning (after hosing the ice off my windows) to get a haircut, during which I refused to take off either of my two jackets or my gloves. And my fingers still got numb. Dried sweet melon slices sound fantastic. Dare I ask how much they are per pound? Thanks for your comment! I love your loot from the market! Such great products! Brrrr! Seriously, dragonmamma, I wanted to cry after that ride. :( I had to be really zen about it and kept repeating "You will not always be cold, this is temporary" during the last minute or two of my ride. I got about 4 ounces of dried sweet melon slices for 2 dollars, so I guess that makes it 8 bucks a pound? They are super flavorful, so a little goes a long way. I've chopped them up and added nuts to the pieces for a little snack, really yummy. Aidells and inari sounds super yummy!! Love the combo! Nom, a bento so full of tasty flavors and contrasts, SB! I agree with Sysyl, the sausages look quite yummy. Hope things warm up soon!! Thanks Sysyl! I felt bad that it didn't have enough veggies, but it sure was tasty!